CNBC Europe (United Kingdom) is in DVB-S2 van start gegaan op 11095.00MHz, pol.V SR:27500 FEC:2/3 SID:429 PID:3082[MPEG-4]/3083 English - BetaCrypt. CNBC Europe (United Kingdom) is in DVB-S2 van start gegaan op 12310.00MHz, pol.H SR:30000 FEC:5/6 SID:1124 PID:3401[H.265]/3402 aac English - Conax. Focus Sat: CNBC Europe is encrypted again after being temporarily unencrypted on 12034.00MHz, pol.V SR:30000 FEC:3/4 SID:30508 PID:451[MPEG-4]/462 English (Conax & Cryptoworks & Irdeto 2 & Nagravision 3). Focus Sat: CNBC Europe (United Kingdom) momenteel ongecodeerd (FTA) te ontvangen (12034.00MHz, pol.V SR:30000 FEC:3/4 SID:30508 PID:451[MPEG-4]/462 English). Focus Sat: CNBC Europe is nu gecodeerd in Conax & Cryptoworks & Irdeto 2 & Nagravision 3 (12034.00MHz, pol.V SR:30000 FEC:3/4 SID:30508 PID:451[MPEG-4]/462 English). Focus Sat & UPC Direct: CNBC Europe (United Kingdom) momenteel ongecodeerd (FTA) te ontvangen (12034.00MHz, pol.V SR:30000 FEC:3/4 SID:30508 PID:451[MPEG-4]/462 English). Focus Sat & UPC Direct: CNBC Europe is encrypted again after being temporarily unencrypted on 12034.00MHz, pol.V SR:30000 FEC:3/4 SID:30508 PID:451[MPEG-4]/462 English (Conax & Cryptoworks & Irdeto 2 & Nagravision 3). Focus Sat & UPC Direct: CNBC Europe is nu gecodeerd in Conax & Cryptoworks & Irdeto 2 & Nagravision 3 (12034.00MHz, pol.V SR:30000 FEC:3/4 SID:30508 PID:451[MPEG-4]/462 English). Canal Digital Nordic: Nieuwe frequentie voor CNBC Europe: 10809.00MHz, pol.H (DVB-S2 SR:25000 FEC:3/4 SID:5203 PID:1232/3242 English- Conax). CNBC Europe in DVB-S op 10949.00MHz, pol.V SR:27500 FEC:3/4 SID:7463 PID:7201/7211 English (FTA). CNBC Europe (United Kingdom) is in DVB-S2 van start gegaan op 12509.00MHz, pol.H SR:6660 FEC:2/3 SID:104 PID:4641[MPEG-4]/4642 aac English - PowerVu. Cosmote: CNBC Europe (United Kingdom) is in DVB-S2 van start gegaan op 11843.00MHz, pol.V SR:27500 FEC:2/3 SID:1085 PID:485[MPEG-4]/585 English - VideoGuard. Cosmote: CNBC Europe in DVB-S2 op 12207.00MHz, pol.H SR:27500 FEC:2/3 SID:1085 PID:485[MPEG-4]/585 English (VideoGuard). Sky Digital: Nieuwe frequentie voor CNBC Europe: 11479.00MHz, pol.V (DVB-S SR:22000 FEC:5/6 SID:50882 PID:2362/2363 English- FTA). Orbit Showtime Network: Nieuwe frequentie voor CNBC Europe: 11372.69MHz, pol.H (DVB-S2 SR:27500 FEC:2/3 SID:429 PID:3082[MPEG-4]/3083 English- BetaCrypt & Irdeto 2). CNBC Europe switched to Nilesat 201 satellite at 12073.00MHz, pol.H (DVB-S2 , 12073.00MHz, pol.H SR:27500 FEC:2/3 PID:3082[MPEG-4]/3083 English). Focus Sat & UPC Direct: CNBC Europe in DVB-S2 op 12034.00MHz, pol.V SR:30000 FEC:3/4 SID:30508 PID:451[MPEG-4]/462 English (Conax & Cryptoworks & Irdeto 2 & Nagravision 3). Meo & Nos: Nieuwe frequentie voor CNBC Europe: 12207.00MHz, pol.H (DVB-S2 SR:27500 FEC:3/4 SID:1314 PID:6025[MPEG-4]/6026 English- Mediaguard 3 & Nagravision 3). Sky Digital: Nieuwe frequentie voor CNBC Europe: 12610.00MHz, pol.V (DVB-S SR:22000 FEC:5/6 SID:50882 PID:2362/2363 English- FTA). Sky Digital: Nieuwe frequentie voor CNBC Europe: 12402.00MHz, pol.V (DVB-S SR:27500 FEC:2/3 SID:50882 PID:2362/2363 English- FTA). Movistar+ (Hispasat) & Nos: Nieuwe frequentie voor CNBC Europe: 12418.00MHz, pol.V (DVB-S SR:27500 FEC:5/6 SID:619 PID:6778/6779 English- Nagravision 3). Meo: Nieuwe frequentie voor CNBC Europe: 12168.00MHz, pol.H (DVB-S2 SR:27500 FEC:3/4 SID:222 PID:4777[MPEG-4]/4778 English- Mediaguard 3 & Nagravision 3). Sky Digital: Nieuwe frequentie voor CNBC Europe: 11623.00MHz, pol.H (DVB-S SR:27500 FEC:2/3 SID:50882 PID:2362/2363 English- FTA). Nieuwe frequentie voor CNBC Europe: 11758.00MHz, pol.H (DVB-S SR:27500 FEC:3/4 SID:7216 PID:1081/1082 English- FTA). 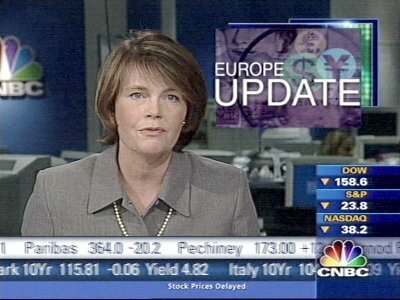 Nos: Nieuwe SR voor CNBC Europe op 12187.80MHz, pol.V: SR:29840 ( FEC:5/6 SID:961 PID:6800/6801 English - Nagravision 3). Nos: Nieuwe frequentie voor CNBC Europe: 12187.80MHz, pol.V (DVB-S SR:27500 FEC:5/6 SID:961 PID:6800/6801 English- Nagravision 3). Cosmote: CNBC Europe in DVB-S2 op 12226.00MHz, pol.V SR:27500 FEC:2/3 SID:1085 PID:485[MPEG-4]/585 English (VideoGuard). CNBC Europe switched to DVB-S at 12012.00MHz, pol.V SR:27500 FEC:3/4 PID:1081/1082 English. Meo: Nieuwe frequentie voor CNBC Europe: 12130.00MHz, pol.H (DVB-S2 SR:27500 FEC:3/4 SID:222 PID:4777[MPEG-4]/4778 English- Mediaguard 3 & Nagravision 3). Cosmote: CNBC Europe in DVB-S2 op 12111.00MHz, pol.V SR:27500 FEC:3/5 SID:1085 PID:485[MPEG-4]/585 English (VideoGuard). Meo: Nieuwe frequentie voor CNBC Europe: 12130.00MHz, pol.H (DVB-S2 SR:30000 FEC:3/4 SID:222 PID:4777[MPEG-4]/4778 English- Mediaguard 3 & Nagravision 3). CNBC Europe switched to DVB-S2 at 12073.00MHz, pol.H SR:27500 FEC:2/3 PID:3082[MPEG-4]/3083 English. Meo: Nieuwe frequentie voor CNBC Europe: 12207.00MHz, pol.H (DVB-S2 SR:26970 FEC:5/6 SID:222 PID:4777[MPEG-4]/4778 English- Mediaguard 3). Viasat: CNBC Europe (United Kingdom) is in DVB-S van start gegaan op 11996.00MHz, pol.H SR:27500 FEC:3/4 SID:4180 PID:4181/4182 English - VideoGuard. Kabel Deutschland: CNBC Europe in DVB-S op 11475.00MHz, pol.V SR:27500 FEC:3/4 SID:50710 PID:961/962 English (BetaCrypt & Nagravision 2 & Nagravision 3 & VideoGuard). CNBC Europe (United Kingdom) is in DVB-S2 van start gegaan op 12012.00MHz, pol.V SR:27500 FEC:9/10 SID:7116 PID:1081/1082 English - FTA. CNBC Europe (United Kingdom) is in DVB-S2 van start gegaan op 11557.00MHz, pol.H SR:30000 FEC:2/3 SID:121 PID:2855[MPEG-4]/2599 English - Nagravision 3. Orbit Showtime Network: CNBC Europe is nu gecodeerd in BetaCrypt & Irdeto 2 & Viaccess 4.0 (12073.00MHz, pol.H SR:27500 FEC:3/4 SID:429 PID:3082/3083 English). Orbit Showtime Network: CNBC Europe (United Kingdom) momenteel ongecodeerd (FTA) te ontvangen (12073.00MHz, pol.H SR:27500 FEC:3/4 SID:429 PID:3082/3083 English). Nos: Nieuwe FEC voor CNBC Europe op 12012.00MHz, pol.V: FEC:5/6 ( SR:27500 SID:961 PID:6800/6801 English - Nagravision 3). Orbit: CNBC Europe in DVB-S op 11604.00MHz, pol.H SR:27500 FEC:3/4 SID:204 PID:512/513 English (Irdeto 2 & Mediaguard 2). CNBC Europe switched to Astra 1G satellite at 12090.00MHz, pol.V (DVB-S2 , 12090.00MHz, pol.V SR:27500 FEC:9/10 PID:1071/1082 English). Cyfra +: CNBC Europe is nu gecodeerd in Mediaguard 3 (11487.77MHz, pol.H SR:27500 FEC:3/4 SID:5125 PID:364/396 English). Cyfra +: CNBC Europe (United Kingdom) momenteel ongecodeerd (FTA) te ontvangen (11487.77MHz, pol.H SR:27500 FEC:3/4 SID:5125 PID:364/396 English). CNBC Europe (United Kingdom) is in DVB-S van start gegaan op 11117.00MHz, pol.V SR:27500 FEC:3/4 SID:14610 PID:6901/6911 English - FTA. Freesat & Sky Digital: PID zijn veranderd voor CNBC Europe op 11261.00MHz, pol.H: PID:2326/2327 English SID:52111 ( SR:27500 FEC:2/3 - FTA). Orbit Showtime Network: Nieuwe SID voor CNBC Europe op 12073.00MHz, pol.H: SID:429 ( SR:27500 FEC:3/4 PID:3082/3083 English - Irdeto 2 & Viaccess 4.0). Sky Digital: CNBC Europe (United Kingdom) momenteel ongecodeerd (FTA) te ontvangen (11261.00MHz, pol.H SR:27500 FEC:2/3 SID:52111 PID:2325/2326 English). Sky Italia: Nieuwe SR voor CNBC Europe op 12466.00MHz, pol.V: SR:29900 ( FEC:3/4 SID:9444 PID:2360/2361 English - VideoGuard). Kabelkiosk: CNBC Europe (United Kingdom) is in DVB-S2 van start gegaan op 11785.00MHz, pol.H SR:27500 FEC:2/3 SID:225 PID:2497/2498 English - Conax & VideoGuard. Sky Digital: PID zijn veranderd voor CNBC Europe op 11261.00MHz, pol.H: PID:2325/2326 English SID:52111 ( SR:27500 FEC:2/3 - VideoGuard). Nos: CNBC Europe is nu gecodeerd in Nagravision 3 (12012.00MHz, pol.V SR:27500 FEC:3/4 SID:961 PID:6800/6801 English). CNBC Europe switched to Hot Bird 13C satellite at 11487.77MHz, pol.H (DVB-S , 11487.77MHz, pol.H SR:27500 FEC:3/4 PID:364/396 English). Canal Digital Nordic: CNBC Europe (United Kingdom) momenteel ongecodeerd (FTA) te ontvangen (11309.00MHz, pol.V SR:24500 FEC:7/8 SID:906 PID:900/901 English). Sky Italia: Nieuwe frequentie voor CNBC Europe: 12466.00MHz, pol.V (DVB-S SR:27500 FEC:3/4 SID:9444 PID:2360/2361 English- VideoGuard). Nos: Nieuwe frequentie voor CNBC Europe: 12012.00MHz, pol.V (DVB-S SR:27500 FEC:3/4 SID:961 PID:6800/6801 English- FTA). Movistar+ (Hispasat): CNBC Europe in DVB-S op 11891.00MHz, pol.V SR:30000 FEC:5/6 SID:73 PID:171/124 Spanish (FTA). Sky Digital: PID zijn veranderd voor CNBC Europe op 11261.00MHz, pol.H: PID:2320/2321 English SID:52111 ( SR:27500 FEC:2/3 - VideoGuard). CNBC Europe switched to Thor 5 satellite at 11309.00MHz, pol.V (DVB-S , 11309.00MHz, pol.V SR:24500 FEC:7/8 PID:900/901 English). Orbit Showtime Network: CNBC Europe is nu gecodeerd in Irdeto 2 (12073.00MHz, pol.H SR:27500 FEC:3/4 SID:430 PID:3092/3093 English). Orbit Showtime Network: CNBC Europe (United Kingdom) momenteel ongecodeerd (FTA) te ontvangen (12073.00MHz, pol.H SR:27500 FEC:3/4 SID:430 PID:3092/3093 English). Cyfra + & TPS: CNBC Europe is nu gecodeerd in Mediaguard 2 & TPScrypt & Viaccess 2.5 (11487.77MHz, pol.H SR:27500 FEC:3/4 SID:5125 PID:364/396 English). Cyfra + & TPS: CNBC Europe (United Kingdom) momenteel ongecodeerd (FTA) te ontvangen (11487.77MHz, pol.H SR:27500 FEC:3/4 SID:5125 PID:364/396 English). Cyfra +: Nieuwe frequentie voor CNBC Europe: 11487.77MHz, pol.H (DVB-S SR:27500 FEC:3/4 SID:5125 PID:364/396 English- FTA). CNBC Europe (United Kingdom) is in DVB-S2 van start gegaan op 12052.00MHz, pol.H SR:30000 FEC:3/4 SID:222 PID:4777[MPEG-4]/4778 English - Mediaguard 2. CNBC Europe switched to Astra 4A satellite at 11938.00MHz, pol.V (DVB-S , 11938.00MHz, pol.V SR:27500 FEC:3/4 PID:3691/3692 English). CNBC Europe switched to Astra 4A satellite at 12303.00MHz, pol.H (DVB-S , 12303.00MHz, pol.H SR:25547 FEC:7/8 PID:1760/1720 English). Sky Digital: PID zijn veranderd voor CNBC Europe op 11261.00MHz, pol.H: PID:2324/2325 English SID:52111 ( SR:27500 FEC:2/3 - VideoGuard). Canal Digital Nordic: CNBC Europe in DVB-S op 11309.00MHz, pol.V SR:24500 FEC:7/8 SID:906 PID:900/901 English (Conax). CNBC Europe (United Kingdom) is in DVB-S van start gegaan op 11063.00MHz, pol.H SR:19280 FEC:3/4 SID:1103 PID:251/260 English - FTA. Nieuwe SR voor CNBC Europe op 11037.00MHz, pol.V: SR:5208 ( FEC:5/6 SID:3 PID:769/770 English - FTA). Nieuwe frequentie voor CNBC Europe: 11037.00MHz, pol.V (DVB-S SR:5210 FEC:5/6 SID:3 PID:769/770 English- FTA). Orbit Showtime Network: Nieuwe frequentie voor CNBC Europe: 12073.00MHz, pol.H (DVB-S SR:27500 FEC:3/4 SID:430 PID:3092/3093 English- Irdeto 2). Sky Italia: Nieuwe frequentie voor CNBC Europe: 11219.25MHz, pol.H (DVB-S SR:27500 FEC:3/4 SID:13357 PID:171/440 English- VideoGuard). Sky Digital: PID zijn veranderd voor CNBC Europe op 11261.00MHz, pol.H: PID:2323/2324 English SID:52111 ( SR:27500 FEC:2/3 - VideoGuard). Nieuwe frequentie voor CNBC Europe: 12556.00MHz, pol.H (DVB-S SR:13320 FEC:5/6 SID:3 PID:769/770 English- FTA). Nieuwe SR voor CNBC Europe op 12606.00MHz, pol.H: SR:13320 ( FEC:5/6 SID:3 PID:769/770 English - FTA). Kabel Deutschland: Nieuwe FEC voor CNBC Europe op 12605.00MHz, pol.V: FEC:9/10 ( SR:27500 SID:53410 PID:701/702 English - Nagravision 2). Sky Digital: Nieuwe SR voor CNBC Europe op 11264.00MHz, pol.H: SR:27500 ( FEC:2/3 SID:52111 PID:2325/2326 English - VideoGuard). Sky Digital: PID zijn veranderd voor CNBC Europe op 11264.00MHz, pol.H: PID:2325/2326 English SID:52111 ( SR:22000 FEC:2/3 - VideoGuard). Viasat: CNBC Europe (United Kingdom) is in DVB-S van start gegaan op 11938.00MHz, pol.V SR:27500 FEC:3/4 SID:3690 PID:3691/3692 English - VideoGuard. CNBC Europe is back on 12092.00MHz, pol.V SR:27500 FEC:3/4 SID:78 after a break ( PID:781/782 English - FTA). Canal Digitaal & Canal & Movistar+ & Noos Numérique: CNBC Europe in DVB-S op 11597.00MHz, pol.V SR:22000 FEC:5/6 SID:10030 PID:307/308 English (FTA). Cyfra + & TPS: Nieuwe frequentie voor CNBC Europe: 11278.36MHz, pol.V (DVB-S SR:27500 FEC:3/4 SID:13012 PID:171/120 English- Mediaguard 2 & TPScrypt & Viaccess 2.4). Orbit: Nieuwe frequentie voor CNBC Europe: 11996.00MHz, pol.H (DVB-S SR:27500 FEC:3/4 SID:28 PID:640/641 English- Mediaguard 2). Orbit: Nieuwe frequentie voor CNBC Europe: 11010.00MHz, pol.H (DVB-S SR:27500 FEC:3/4 SID:28 PID:640/641 English- Mediaguard 2). Orbit: CNBC Europe (United Kingdom) is in DVB-S van start gegaan op 11093.00MHz, pol.H SR:27500 FEC:3/4 SID:26 PID:1104/1105 English - Mediaguard 2. Nieuwe frequentie voor CNBC Europe: 12606.00MHz, pol.H (DVB-S SR:28800 FEC:5/6 SID:3 PID:769/770 English- FTA). ADD: PID zijn veranderd voor CNBC Europe op 11804.00MHz, pol.H: PID:523/760 English,761 English SID:1013 ( SR:27500 FEC:3/4 - Irdeto 2). Sky Digital: PID zijn veranderd voor CNBC Europe op 12324.00MHz, pol.V: PID:2314/2317 English SID:5706 ( SR:27500 FEC:2/3 - VideoGuard). Sky Italia: PID zijn veranderd voor CNBC Europe op 11977.00MHz, pol.H: PID:2455/2456 English SID:8135 ( SR:27500 FEC:3/4 - VideoGuard). Sky Digital: Nieuwe frequentie voor CNBC Europe: 11264.00MHz, pol.H (DVB-S SR:22000 FEC:2/3 SID:52111 PID:2329/2330 English- VideoGuard). Kabel Deutschland: CNBC Europe in DVB-S op 12605.00MHz, pol.V SR:27500 FEC:3/4 SID:53410 PID:701/702 English (Nagravision 2). ADD: PID zijn veranderd voor CNBC Europe op 11804.00MHz, pol.H: PID:524/5634 English SID:1013 ( SR:27500 FEC:3/4 - Irdeto 2). Sky Italia: PID zijn veranderd voor CNBC Europe op 11977.00MHz, pol.H: PID:2456/2457 English SID:8135 ( SR:27500 FEC:3/4 - Mediaguard 2 & VideoGuard). Digitürk: CNBC Europe is nu gecodeerd in Cryptoworks (11658.00MHz, pol.V SR:30000 FEC:3/4 SID:7307 PID:2106/2207 Turkish). Digitürk: CNBC Europe is nu gecodeerd in Cryptoworks (11617.00MHz, pol.V SR:30000 FEC:3/4 SID:7307 PID:2106/2207 Turkish). Digitürk: CNBC Europe (United Kingdom) momenteel ongecodeerd (FTA) te ontvangen (11617.00MHz, pol.V SR:30000 FEC:3/4 SID:7307 PID:2106/2207 Turkish). Digitürk: CNBC Europe (United Kingdom) momenteel ongecodeerd (FTA) te ontvangen (11658.00MHz, pol.V SR:30000 FEC:3/4 SID:7307 PID:2106/2207 Turkish). Digitürk: Nieuwe frequentie voor CNBC Europe: 11617.00MHz, pol.V (DVB-S SR:30000 FEC:3/4 SID:7307 PID:2106/2207 Turkish- Cryptoworks). Nos: Nieuwe frequentie voor CNBC Europe: 11891.00MHz, pol.H (DVB-S SR:27500 FEC:3/4 SID:767 PID:4192/4193 English- Nagravision & Nagravision 2). Sky Italia: PID zijn veranderd voor CNBC Europe op 11977.00MHz, pol.H: PID:2451/2452 English SID:8135 ( SR:27500 FEC:3/4 - Mediaguard 2 & VideoGuard). Nieuwe SID voor CNBC Europe op 12092.00MHz, pol.V: SID:78 ( SR:27500 FEC:3/4 PID:781/782 English - FTA). Nieuwe SID voor CNBC Europe op 12092.00MHz, pol.V: SID:313 ( SR:27500 FEC:3/4 PID:3131/3132 English - FTA). Nieuwe frequentie voor CNBC Europe: 11597.00MHz, pol.V (DVB-S SR:22000 FEC:5/6 SID:10030 PID:307/308 English- FTA). Sky Italia: Nieuwe frequentie voor CNBC Europe: 11977.00MHz, pol.H (DVB-S SR:27500 FEC:3/4 SID:8135 PID:2453/2454 English- Mediaguard 2 & VideoGuard). Cosmote: CNBC Europe is back on 12524.00MHz, pol.V SR:27500 FEC:3/4 SID:10 after a break ( PID:2336/2337 English - FTA). CNBC Europe is back on 12524.00MHz, pol.V SR:27500 FEC:3/4 SID:10 after a break ( PID:515/680 English - FTA). Cosmote: CNBC Europe (United Kingdom) is in DVB-S van start gegaan op 12524.00MHz, pol.V SR:27500 FEC:3/4 SID:9 PID:2330/2331 English - FTA. CNBC Europe is back on 12092.00MHz, pol.V SR:27500 FEC:3/4 SID:23 after a break ( PID:2203/2213 English - FTA). Noos Numérique: CNBC Europe (United Kingdom) momenteel ongecodeerd (FTA) te ontvangen (12610.00MHz, pol.V SR:22000 FEC:5/6 SID:12200 PID:944/945 English). Canal Digitaal: PID zijn veranderd voor CNBC Europe op 12343.00MHz, pol.H: PID:516/84 English SID:2010 ( SR:27500 FEC:3/4 - Irdeto 2 & Mediaguard 2). Cyfra + & TPS: CNBC Europe is nu gecodeerd in Mediaguard 2 & TPScrypt & Viaccess 2.4 (11283.00MHz, pol.V SR:27500 FEC:3/4 SID:13012 PID:171/120 English). Cyfra +: CNBC Europe (United Kingdom) momenteel ongecodeerd (FTA) te ontvangen (11283.00MHz, pol.V SR:27500 FEC:3/4 SID:13012 PID:171/120 English). Nieuwe frequentie voor CNBC Europe: 12092.00MHz, pol.V (DVB-S SR:27500 FEC:3/4 SID:23 PID:2203/2213 English- Viaccess 2.3). ADD: Nieuwe frequentie voor CNBC Europe: 11804.00MHz, pol.H (DVB-S SR:27500 FEC:3/4 SID:1013 PID:3001/3002 English- Irdeto 2). Sky Italia: Nieuwe frequentie voor CNBC Europe: 11958.00MHz, pol.V (DVB-S SR:27500 FEC:3/4 SID:10916 PID:167/108 English- Mediaguard 2 & VideoGuard). Sky Digital: PID zijn veranderd voor CNBC Europe op 12324.00MHz, pol.V: PID:2311/2312 English SID:5706 ( SR:27500 FEC:2/3 - VideoGuard). Canal Digitaal: CNBC Europe is nu gecodeerd in Mediaguard 2 (12343.00MHz, pol.H SR:27500 FEC:3/4 SID:2010 PID:161/84 English). Noos Numérique: CNBC Europe is nu gecodeerd in TPScrypt (12610.00MHz, pol.V SR:22000 FEC:5/6 SID:12200 PID:944/945 English). Sky Digital: PID zijn veranderd voor CNBC Europe op 12324.00MHz, pol.V: PID:2314/2315 English SID:5706 ( SR:27500 FEC:2/3 - VideoGuard). --: PID zijn veranderd voor CNBC Europe op 12324.00MHz, pol.V: PID:2311/2312 English SID:5706 ( SR:27500 FEC:2/3 - --). ADD: Nieuwe frequentie voor CNBC Europe: 12034.00MHz, pol.H (DVB-S SR:27500 FEC:3/4 SID:716 PID:3094/3095 English- Irdeto 2). Cyfra +: CNBC Europe (United Kingdom) is in DVB-S van start gegaan op 11283.00MHz, pol.V SR:27500 FEC:3/4 SID:13012 PID:171/120 English - Cryptoworks & Mediaguard 2. Nieuwe frequentie voor CNBC Europe: 12711.00MHz, pol.V (DVB-S SR:27500 FEC:3/4 SID:23 PID:2203/2213 English- FTA). CNBC Europe (United Kingdom) is in DVB-S van start gegaan op 12591.00MHz, pol.V SR:27500 FEC:3/4 SID:23 PID:2203/2213 English - FTA. Sky Digital: PID zijn veranderd voor CNBC Europe op 12324.00MHz, pol.V: PID:2315/2316 English SID:5706 ( SR:27500 FEC:2/3 - VideoGuard). Telepiù: PID zijn veranderd voor CNBC Europe op 12054.00MHz, pol.H: PID:163/92 SID:11503 ( SR:27500 FEC:3/4 - Mediaguard 2 & VideoGuard & Cryptoworks). Nieuwe frequentie voor CNBC Europe: 12610.00MHz, pol.V (DVB-S SR:22000 FEC:5/6 SID:12200 PID:944/945- FTA). Sky Digital: PID zijn veranderd voor CNBC Europe op 12324.00MHz, pol.V: PID:2312/2313 SID:5706 ( SR:27500 FEC:2/3 - VideoGuard). ADD: PID zijn veranderd voor CNBC Europe op 11881.00MHz, pol.H: PID:3013/3014 SID:1706 ( SR:27500 FEC:3/4 - Irdeto 2).